This Amish Poly Outdoor Lumbar Rocking Chair is outdoor furniture proudly made in the USA! Relax in this eco-friendly old fashioned rocking chair. Purchase a set of poly rockers today! This Amish Poly Outdoor Lumbar Rocking Chair is maintenance-free choice since it is crafted from poly lumber. Poly lumber is a wood lumber substitute made from recycled milk jugs and bottles and will not chip, crack, rot, or develop mold. This poly rocking chair will never need to be painted or stained like wood outdoor furniture. Please allow one to three weeks for the rocker to arrive depending on the time of year. Call one of our Amish furniture specialists with more specific questions on this poly furniture. This porch rocker also ships completely assembled. 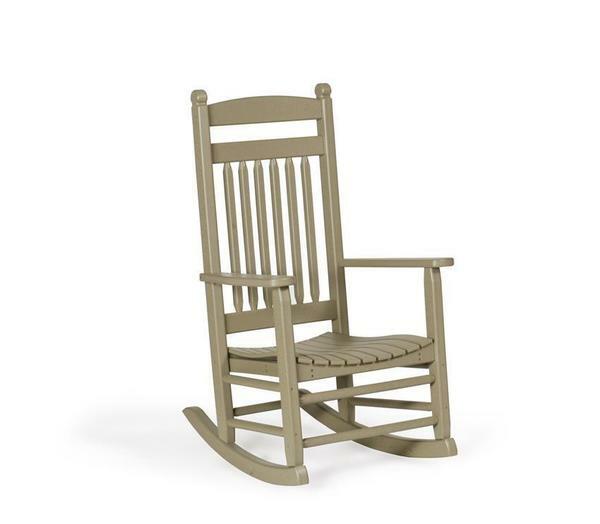 Other popular rocking chair styles are our Amish Poly Outdoor Rocking Chair and the Amish Poly Adirondack Fan Back Rocker.